Updated: Jan. 26, 2016 at 12:47 a.m.
Thomas LeBlanc, the executive vice president and provost at the University of Miami, has already managed to balance finances and academics in his current job, and will now have to learn the ropes at an institution with different fiscal hurdles but a similar debt load. During the search for the new president, faculty said they wanted a candidate who was prepared to take on GW’s $1.7 billion debt and the roughly 60 percent dependence on tuition dollars to fund the University’s operating budget. But LeBlanc isn’t coming in completely blind – he helped chair GW’s accreditation in 2008, and faculty members said when they interviewed him earlier this month, he was aware of the University’s financial issues. Richard Vedder, an economics expert at Ohio University who specializes in higher education finance, said GW is similar to other private institutions that are “desperate” for students. Professors who have worked with LeBlanc pointed to his ability to listen to all constituents, including students, alumni, faculty and staff in making decisions, including financial ones, and said he was able to think broadly about how national trends could affect a university. They said he also used his dual viewpoints in academics and finances to see how academic decisions influenced financial ones, instead of vice versa. GW relies on tuition for about 60 percent of the institution’s total revenue, which experts say puts it in a difficult position as expenses rise and higher education becomes less affordable. Miami relies on tuition for only 18 percent of the total revenue and is instead heavily reliant on revenue from their hospital, with net patient revenue totaling 54.1 percent of the total revenue the institution earned in fiscal year 2016, according to Miami’s financial documents. GW Hospital is run by University Hospital Services and is separate from the rest of the University. Vedder, the expert from Ohio University, said national enrollment at private institutions is down overall for the fifth straight year, which can put tuition-reliant universities like GW in a precarious position. He added that the high-level of tuition dependence makes GW “vulnerable,” and that LeBlanc could face a challenge in weaning the University off this reliance. “It would strike me that GW is more tuition dependent than virtually any of the top 50 or 100 private universities in the United States that I can think of,” Vedder said. LeBlanc will also have to deal with the University’s debt, which in 2016 reached $1.7 billion, surpassing the size of the roughly $1.57 billion endowment. 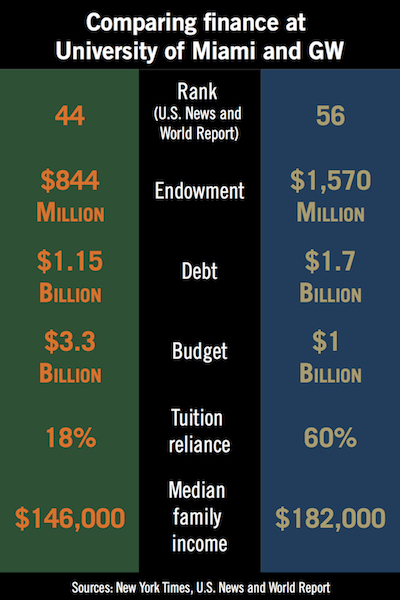 Miami has a smaller endowment of $844.6 million while balancing a relatively high debt of $1.15 billion. Vedder said LeBlanc will have to make strides in fundraising at the University to make up for the debt. Miami is the dominant private institution in its area, Vedder said, while GW has to compete with a group of local universities like Georgetown, Catholic and George Mason universities and the University of Maryland for donations from local, non-alumni sources. GW is approaching its $1 billion fundraising goal a year ahead of schedule, but officials have said they are leaving the last year of the campaign open for other fundraising opportunities. The University of Miami surpassed a major $1.6 billion fundraising goal in May 2015, ending their campaign early, in large part because of more than 260 donations that each topped $1 million. Another major donation of $100 million was announced during the inaugural address of Miami’s new president, Julio Frenk, last year, according to Quintana. JoNel Newman, an associate professor of clinical legal education and second vice chair of the faculty senate at Miami, said LeBlanc managed to keep Miami’s debt load low during his tenure. “We have not experienced what you just described in large part because he is extremely prudent about reserves and about sustainable paying as each individual school goes along,” Newman said.